Iron Bowl: SG100 is about LKY? 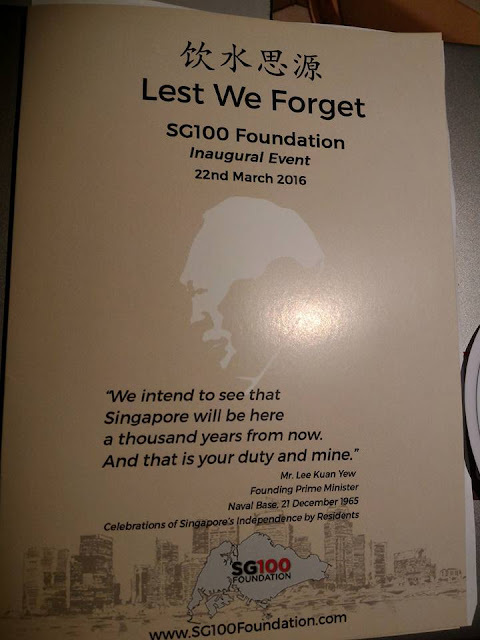 I was invited to a SG100 event, talking about building a future of Singapore, nurturing young generation and moving forward, but when I spoke to some of the young organizers, immediately I was confused as they shout slogans like "I love LKY", "I miss LKY" like they were suffering from Tourettes syndrome. The food served was indeed expensive.. Sharks Fin, Abalone, Tiger Prawns... And quality was not bad, but I wondered about the intentions of this "foundation" which was a LLP and hysterical members who chanted about LKY. If I was not from Singapore, I would have thought that there was some kind of extremist religious convention going on. I do respect LKY. He was a man with conviction and used ISA to wrongfully detain the co-founder of PAP and the rest was history to be rewritten, and young generation are still calling his name after his death -- with fervor.